Can you image your homeschool high schoolers enjoying an understanding of other cultures while building their Language Arts credit? 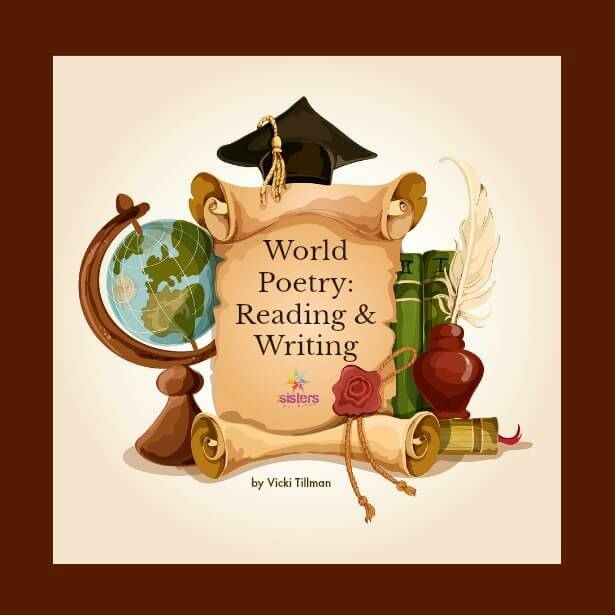 Download World Poetry: Reading and Writing for your teens. World Poetry: Reading and Writing gives teens a glimpse of various world cultures BUT not in a stuffy, overly-serious format. One powerful way to truly learn about another culture is to read a little of it’s literature. Through World Poetry: Reading and Writing, teens’ eyes open to different perspectives and get a glimpse into some cultures around the world. In this 5-week guide teens will learn about several poetic styles from various world regions. Homeschoolers will read famous examples of each type of poetry, then write their own poems in each style. Note: You will need the internet to read the example poems. Homeschool high schoolers will read short selections of poetry and try their hands at writing most of the styles of poetry. “Don’t kill the topic by busywork” is the motto of this course. In this 32-page, 5-week course, young people will complete one quick lesson each day, 4 days per week. This downloadable workbook includes an answer key to help parents with grading. Click here for a free excerpt of World Poetry: Reading and Writing. Your homeschool high schoolers will enjoy World Poetry: Reading and Writing. Download a copy today.